Any discussion of a united Korea’s economic future must consider the potential for a perilous and drawn-out transition. Recent events have brought the topic of Korean unification back into public debate. Republic of Korea (ROK) President Park Geun-hye gave an important address on the subject last spring in Dresden, Germany. Last fall, Kim Jong-un’s month-long disappearance got observers speculating about his health and whereabouts. Was Kim still in power? Was the regime losing its grip? Kim reappeared (apparently having undergone ankle surgery), but speculation continues about North Korea’s political stability. And last November, the 25th anniversary of the fall of the Berlin Wall encouraged further comparisons between German and Korean unification. In these discussions of Korean unification, observers have debated its economic benefits versus costs. While some analysts emphasize a unified Korea’s tremendous economic potential, others warn of the huge price tag required to bring the DPRK up to the ROK’s living standards. These debates are important, but the economics of Korean unification cannot be discussed alone. Any discussion of Korea’s economic future must consider the potential for what might be a truly perilous and drawn-out transition. But aside from bulls and bears, there’s an 800-pound gorilla in the room: the great uncertainty of the transition period. Aidan Foster-Carter cautions that discussions of a unification bonanza tend to start with the assumption of a peaceful, negotiated transition. But the road to unification could, of course, be far messier, and could include a humanitarian disaster, a refugee crisis, civil war, and loose nukes. The way that the Koreas unify will have profound effects on the country’s future economic success and political stability. Analysts of Korean unification have long discussed “soft” versus “hard” landings.” Regarding the former, unification might indeed occur peacefully, through a negotiated settlement and an orderly transition (which avoids an anarchic, unstable period in which authority is contested). This was the fortunate end to German division, and this would be the most orderly, least dangerous way for the Koreas to unite — and the quickest way for a unified Korea to realize an economic bonanza. But unification might also occur through the collapse of the North Korean government — perhaps during an interstate war, or in the midst of a power struggle or civil war in the North. In contrast to a negotiated settlement, collapse scenarios could be extremely dangerous. In the wake of a North Korean regime collapse, instability could take a variety of forms. If government-provided food and health services were to cease, the result could be a humanitarian disaster fraught with hunger and disease. Militias or gangs could seize the country’s numerous weapons caches, and could prey on the population or fight for territory. Hunger and insecurity could lead people to flee to China or South Korea for safety. And don’t forget North Korea’s arsenal of nuclear weapons and other weapons of mass destruction (WMD). Assembled atomic bombs, fissile material, pathogens, and toxic chemicals could disappear across international borders. If such instability were to occur, South Korea and other countries may decide to send military forces into North Korea to perform stability operations. In the scenario we examined, such operations might include direct humanitarian relief and policing of major cities and roads, border control, elimination of WMD, conventional weapons disarmament, and operations to deter or defeat pockets of violent resistance. In our study, Bennett and I modeled the force requirements for these five missions. Among them, by far the most demanding (in terms of force requirements) is the humanitarian stability operation. The purpose of this mission would be to control roads and other transportation infrastructure, to transport, protect and distribute food and medicine to the North Korean people, and to take over the responsibilities of the police to provide public security. Performing this mission would be important to prevent instability, hunger and illness in the North, and to prevent large numbers of North Koreans from fleeing in search of food and security. Analysts of stability operations usually base their estimates for force size on the size of the local population. Historically, operations with little to no popular resistance have required about four peacekeepers per 1,000 people in the population. More challenging operations have required closer to 20 peacekeepers. For our purposes, we adopted a mid-range estimate of 13 peacekeepers per 1,000 people, which (based on the then-North Korean population of 23 million) yielded a requirement of 312,000 peacekeepers. For a variety of reasons (related to diplomacy, logistics and North Korea’s inadequate infrastructure), it may not be possible to flow a force of this size into North Korea all at once. Therefore, we also modeled a stability operation by dividing North Korea into horizontal tiers and estimated that the tiers would be stabilized sequentially. Such an operation would have lower force requirements than one that sought to stabilize the entire country simultaneously. For each of the five missions, Bennett and I used historical and theoretical metrics in order to estimate force requirements. 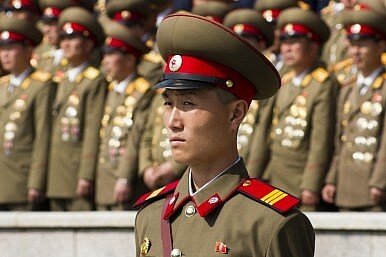 The second-most demanding mission in terms of requirements was the disarmament mission, which could require in the range of 50,000 soldiers to adequately disarm North Korean forces. Failing to perform this mission would risk arms caches falling into the hands of insurgents, as the experience of Iraq shows all too well. All told, the five missions we examined would require 260,000 to 400,000 soldiers. This exceeds the number of military forces that the United States sent to Iraq and Afghanistan. As noted earlier, these numbers were calculated under the assumption that after a collapse, the North Korean military would cooperate and the North Korean people would not resist. Other analysts might dispute this assumption, arguing that stabilization forces would encounter violent resistance and that civil war would be ongoing in the North. If one expected North Korean resistance to stability forces, this would add substantially to the numbers we produced. Force requirements would be higher because one would need to add additional missions to the list of missions we analyzed — for example, the need to subdue civil war and to perform counterinsurgency operations. And force requirements would be higher because one should assume more dangerous conditions for the missions we analyzed. For example, for the humanitarian stability operation we used a mid-range ratio of soldiers/population (13 per 1,000). If one expects more dangerous conditions, then it would be appropriate to use a number closer to the 20:1,000 ratio that historically, more challenging stability operations have demanded. Using that ratio, a North Korean stability operation — just that one mission — would require 460,000 soldiers. Aside from the massive human and financial costs of the transition period, the duration of transition may also delay Korea’s “bonanza.” Some of the stability operations could take years — for example, the disarmament and destruction of North Korea’s massive and rusting military forces. Stability forces would need to find and secure weapons on North Korea’s many bases and in its potentially huge number of weapons and ammunition caches. North Korea is also said to have thousands of tunnels and underground facilities, which would need to be searched for WMD, conventional weapons, and ammunition stocks. Finding, sorting through, and destroying North Korean weaponry will be a huge project that would take years, as it did in the case of German unification. As the problems of transition linger, the economic dividends from unification will be delayed. If the Chinese military drops down into North Korea to stabilize China’s southern border — which, in the event of a crisis in North Korea, most analysts see as likely — this would create a precarious situation. It could take some time before Seoul is able to negotiate the PLA out of the country. Meanwhile, what investors will eagerly surge their capital and managers into an area with an ongoing standoff between American, Chinese, and Korean military forces? The end of a divided Korea would be a momentous event. In the long term, as President Park extolled at Dresden, and as other analysts have pointed out, Korean unification would bring a welcome peace dividend for Korea, the United States, and other countries. A unified Korea may also someday enjoy great economic success. And as we discuss the costs and benefits of unification, we should, of course, remember the real bonanza — that the North Korean people would finally be rid of an oppressive and brutal regime. But conversations about the costs and benefits of unification must recognize tremendous uncertainty about the transition period — the dangers of which could have significant consequences for the political stability and economic potential of a unified Korea. Jennifer Lind is Associate Professor of Government at Dartmouth, and the author of Sorry States: Apologies in International Politics (Cornell, 2008). Follow on Twitter @profLind. What Happens If North Korea Collapses? If Kim Jong-un's regime collapses, how will China, the U.S., and South Korea react?